Welcome! You've come to the right place. The sub-forum on the 5 series will prove to be an invaluable resource. 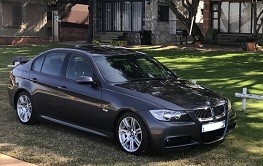 Just curious have you not considered maybe the 530d? mix of Fuel economy and power. Can't go wrong with an M-Sport e60! Still drool for one in Space Grey! I saw that most people prefer the diesel variants of these models under the 5 subforum but as a person coming from a Subaru, I'd like an NA model hence the 523i/525i (even though they're less economic than the diesels. (13-02-2019 02:45 PM)UpNcOmiNg! Wrote: Welcome mate. That's the exact spec that did it for me, with the black wheels. It looks so good! Know the price range of those nowadays? Been scrolling through the for sale subforum and can't seem to find them.